FOOLISH FIRE showed outstanding talent defeating the 800k earning Sprinter BIG MONEY by 2.8 Lengths in a Muswellbrook trial, with both her Trainer Cameron Crockett and Jockey Greg Ryan expecting a big bright future. Unfortunately she went amiss through no fault of her own and didn't get the opportunity to show her exciting ability at the races. 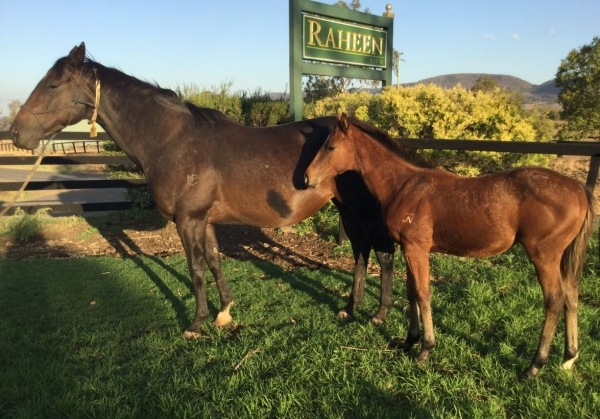 She is by Redoute's Group 1 producing son NADEEM from the LAST TYCOON mare WISP a half sister to multiple Group winner HONOUR THE NAME from the family of VEGA MAGIC, NATURAL BLITZ and Golden Slipper winner CENTURY MISS. Foolish Fire is in Foal POWER (GB), a Group 1 winner at Two and Three who stood his first season in Australia in 2018 and was 2016/2017 Champion First Season Sire in NZ. NADEEM (AUS) (2003). 2 wins at 2, MRC Blue Diamond S., Gr.1. Sire of 291 rnrs, 194 wnrs, 16 SW, inc. Sterling City (Meydan Dubai Golden Shaheen, Gr.1), Happy Galaxy, Mujaarib, Tajmeel, etc. Sire of the dams of SW Pretty in Pink, Infamous Fox and of Dame of Thrones, Bon Allen, Vital Dancer, La Renarde, Too Free Too, For All We Know, Miss Bourbon Bar, Smart Master, Elise, I'm Dun Dreamin', Miss Brixton, Seattle Kid, Stage Front, Darkside, etc. SUNSET ROCK (Domesday). Winner at 2, SAJC Cinderella S., L, 2d SAJC Tattsbet Adelaide Cup Day 2YO H.
Winning Accord. 4 wins to 1550m, 2d SAJC Tattsbet Adelaide Cup Day 2YO P., 3d SAJC Darley 2YO H., Ipswich TC Channel 7 H., SCTC Suncoast Cabs H., 4th SAJC Sires' Produce S., Gr.3. Al's Knight (g. by Fastnet Rock). 4 wins to 1400m, Singapore TC Class 4 H., Taurus S., Initiation H., Class 3 H., 2d Singapore TC Kranji C S., Icap Singapore S., Pan Malaysian Pools Trophy, Class 3 H.
Garrett County (g. by Not a Single Doubt). 2 wins at 1300m, 1400m in Aust. Tycoon Bill (g. by Danesis). Winner at 1000m in 2018-19 in Aust. Miss Redlan (f. by Duke of Marmalade). Winner at 1400m in Aust. Bon Anna. 2 wins at 900m, 1200m in 2018-19 in Aust. HONOUR THE NAME (Royal Academy). 4 wins-1 at 2-to 1200m, A$331,280, SAJC Angas Brut S., Gr.2, VATC HDF McNeil S., Gr.3, Sir John Monash S., L, Mona Nursery S., 2d MVRC Manikato S., Gr.1, 3d VATC Blue Diamond Preview (c&g), Gr.3, Safeway H., Geoff Murphy H., 100% Smokefree Indoor P., 4th MVRC Schweppes S., Gr.2, VATC Bletchingly S., Gr.3, WATC Belmont Newmarket H., L.
Grand Destiny (Redoute's Choice). 5 wins from 2000m to 2500m, A$357,232, VRC William Newton VC H., Baden-Baden Trophy H., MRC Even Stevens H., VRC Bitalli H., MVRC Super Member Home Loan P., 2d VRC Comedy King H., TAB Big 6 Mega Jackpot H., MVRC Gillies Famous Pies H., MRC Rokk Ebony H., 3d VRC Bagot H., L, William Newton VC H., 4th VRC Andrew Ramsden S., L.
Wisp. 3 wins. See above. Doctor Taurus. Winner at 1000m in Aust. Darlington Point. Placed in Aust. Celebration Lane. Placed in Aust. Control. Winner at 1700m in Aust. Call Me Irish. 3 wins from 1200m to 1800m, WRC Stevens Motors H., 3d Taranaki RC Waterfront Hotel H., Punting Comp Sat 22nd July7 H.
Silked. Winner at 1000m in Aust. Stark Tony. Winner at 1400m in Aust. LILTING (Twig Moss). Winner. See above. Ring Craig. 3 wins at 1100m, 1400m, 3d BTC Ambassador Travel H.
Million Darling. Winner at 1200m, HKJC Repulse Bay H., 2d HKJC Bravo H., French Racing & Breeding H., Shui Long Wo H., 3d HKJC Man Cheung H.
Mister Lane. 9 wins from 1250m to 1900m, A$75,450 in Aust. Freeway. 4 wins-3 at 2-to 1200m in Aust. Forsaken. 2 wins at 1100m in Aust. Producer. Chrysos. Winner at 1200m in Aust. Broad Outline. Winner at 1300m, 2d STC William Inglis H., AJC Empyrean H., STC Rydalmere H.
What a Year - Royal Jet (Mal.). Winner at 1200m in Malaysia, 2d STC Delwood Touring Club H., 3d AJC Tom Hill H.
Primrose Lane. 3 wins. See above. 2017 f. Unique Vision, by Husson. Unraced. 2018 c. by Golden Archer. Served by Power. Date of last service, 23.11.2018. 02/Aug/2014 2nd of 8 --trial--Coonabarabran JC Barrier Trial, 900m. Sooner or Later was 1st and Coonawaugh 3rd. 06/Oct/2014 2nd of 7 --trial--Muswellbrook RC Barrier Trial, 1000m. Alpen Rose was 1st and Big Money 3rd.